I first became aware of Ian McKellen as a gay activist when he publicly came out against a law in England in 1988. I was aware of his being an admired stage British actor who occasionally made films and then, after he came out, I saw him in “And The Band Played On” and “6 Degrees of Separation” but it was 17 years ago in a movie called “Gods and Monsters”, for which he won an Oscar nomination, that I was really impressed with him. The general movie going public came to know him as Gandalf in “Lord of the Rings” for which he received a second Oscar nomination. He is now regarded as one of the world’s best actors and is widely known as a role model for the gay community all over. Now, 17 years after “Gods and Monsters”, he is reunited with director Bill Condon to make “Mr. Holmes”, a story about the real Sherlock Holmes at the age of 93, retired, looking at his last case which took place 27 years earlier. McKellan, in his 70s, plays Holmes at 93, 66 and 58 believable at all stages with a lot of help from make-up artist Dave Elsey, and his crew, along with the actor‘s movements at the different ages. \This Sherlock Holmes is not the Sherlock Holmes you know, telling an admirer that it was Watson who fictionalized his character, giving him a deerstalker hat which he never wore and a pipe when he preferred a cigar, giving the readers a wrong address as to where he lived though the detective did and still has that precision and deductions that solved his mysteries and solves a present day situation. He is now a beekeeper in his old age along with following the search for ‘prickly ash’ to help him with his memory which is failing. Based on a screenplay by Jeffrey Hatcher from a book by Mitch Cullin (Sir Arthur Conan Doyle, who?) 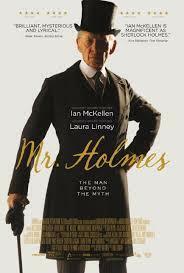 it revolves around Holmes, his housekeeper Mrs. Munro, played by Laura Linney, in a role she could have done in her sleep but doesn’t, and her son Roger, (Milo Parker), who lost his father at a very young age, a clever somewhat precocious 10 year old who becomes devoted to Holmes and who Holmes comes to see as a remarkable child. There is a side trip story regarding Japan and a Japanese mother and her son whose husband/father abandoned them to serve England in the war, which really doesn’t bring much to the movie. Another part of the screenplay is Holmes’s last mystery with Patrick Kennedy as Thomas Kelmot who thinks his wife Ann, played by Hattie Morahan, is cheating on him. There is also Nicholas Rowe, who plays the fictional Sherlock Holmes in a film being watched by the ‘real’ Sherlock Holmes and in a wasted role Frances de la Tour as a eccentric music teacher. Ian McKellen is a delight to watch, Laura Linney, in a dark wig, is powerful in a brief scene near the end with him and Milo Parker has chemistry with McKellen but I found myself walking up the aisle, after the credits, giving it a one word review in my mind, ‘disappointment’, which may be my fault expecting too much from another pairing of Condon and McKellen.